Chamber ensembles are a lot like families, developing communication and understanding that are clearly evident, yet undecipherable to outsiders. 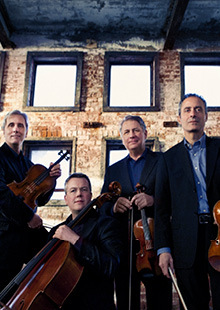 The Emerson Quartet family has been communicating for 40 years through hundreds of performances around the world and in more than 30 recordings that have won them nine Grammy awards. The group is known for a broad palette of tonal colors, and for the musical sensitivity and technical ability to seamlessly match those sounds, from instrument to instrument, in breathtakingly fine chamber playing. Underwritten by Susan and Karl Horn; Liz and Alan Lerner; Robin Black.